I've been itching to shoot some high fashion photographs so I drug Melanie out into the cold of downtown Edmonds to this alleyway across the street from Sandy B's little diner. I was trying to go for an exaggerated look with lots of different patterns and textures. 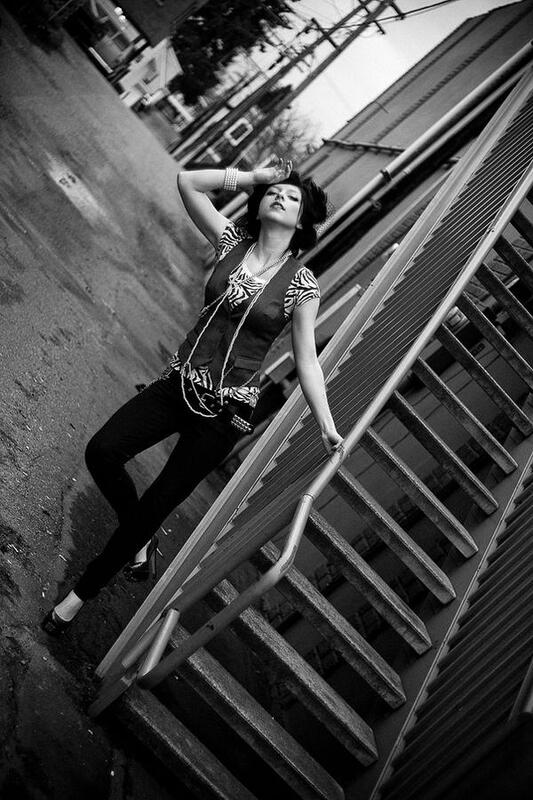 I dressed her in a punk rocker-esque outfit with the zebra stripes, skinny jeans, a chained belt and the gray vest, but evened it out and added to the pretty high fashion side by having her wear a ridiculous amount of different pearl necklaces, rings and a pair of six inch heels. I designed her hair by backcombing the crap out of it. I essentially did everything you would never do to your hair by tangling it and making it as big as possible, then spraying and fastening with pins. I also added some messy pincurls into the style but they're difficult to see with her black hair. Over all, I was pretty proud of the final up-do.